While many expected that the first performance package for the new Dodge Dart would be the same R/T trimline featured on the rest of the Dodge lineup – this morning the Chrysler Group introduced the first performance oriented trimline in the form of the 2013 Dodge Dart GT. While it is unusual for the modern Dodge lineup to use the GT moniker instead of R/T for a performance package, the 2013 Dodge Dart GT follows in the tradition of the vintage Dart performance trimlines dating back to 1963. While many other Dodge vehicles in the 1960s and 1970s used the R/T name for their performance trimlines (like the Challenger and Charger), the Dart performance models wore the GT badge so with the introduction of the 2013 Dart GT, the Chrysler Group harkens back to the golden days of Mopar performance. 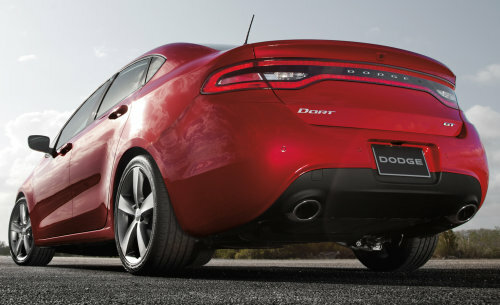 The biggest news for the 2013 Dodge Dart GT is the name as the Chrysler Group has been showing off what we expected to be called the Dart R/T since the debut in 2012. In fact, along with some of the specifications of this performance package, there have been pictures available online for months so the content of the new Dart GT doesn’t come with many surprises – although that really doesn’t make the new GT any less significant in the hotly contested compact sedan segment. The 2013 Dodge Dart GT is a performance package so we will start by looking at what should make the GT the most engaging Dart to drive thus far (as there is supposed to be an SRT variant coming in the near future). The GT package begins under the hood where a 2.4L Tigershark MuliAir2 4-cylinder engine provides 184 horsepower and 174lb-ft of torque – making the Dart GT the most powerful trimline for the new Dodge compact sedan. That power is channeled to the front wheels via a standard 6-speed manual transmission although those who don’t want to do the shifting can opt for a 6-speed “AutoStick” automatic transmission. A set of 18” 5-spoke rims wrapped in performance tires help increase the grip while a sport tuned suspension system featuring frequency-sensing damping shocks that are unique to the GT which should help make this the best handling Dart as well as the quickest. On the outside, the 2013 Dodge Dart GT differentiates itself from the Dart Limited with an aggressive front fascia featuring a Hyper Black grille and fog light bezels, integrated polished dual exhaust tips, unique GT badging and of course, that awesome LED “racetrack” tail light setup that is very similar to the design that debuted on the current Dodge Charger. Inside, the Dart GT features heated Nappa leather seats, a heated steering wheel, dual zone temperature control, the 8.4-inch touchscreen infotainment system and the 7 inch TFT customizable gauge cluster. The Dart GT also comes with all of the amenities found in the Dart Limited so there are very few features available in the C segment sedan class that the Dart GT doesn’t include. The 2013 Dodge Dart GT builds on the Dart Limited which means that in addition to being the most powerful and the most well equipped Dart – it is also the most expensive. The Dart GT will start at $20,995 but when you consider all of the goodies added compared to the Dart Limited, a $1,000 upcharge looks like a bargain. In fact, when you configure a Dart Limited with the 1.4L Turbo engine that offers less power, the starting price is actually higher than that of the Dart GT. So, what about the Dodge Dart R/T…is it dead? Not exactly. Today’s announcement from Dodge stated that “Dodge continues to investigate a high-performance R/T model” so it seems that a higher performance model wearing the R/T badge is not out of the question. On the other hand, with the SRT variant of the Dart sedan expected within the next year – it might be hard for Dodge to fit the R/T into the lineup logically. The 2013 Dodge Dart GT will make its grand debut next week at the 2013 North American International Auto Show and which point we will have a ton of unique images of the new Dart performance package. In the meantime, click any of the thumbnails above on the right to have a look at the Dart GT when it was introduced months ago as the Dodge Dart R/T. There is also a picture of the Dart Limited in that gallery for reference.